I entered the birth world bright eyed and bushy tailed, as the saying goes, because birth truly is a magical experience. But labor is hard, challenging, and unpredictable. True to its name, it is laborious. The weeks leading up to ‘going into labor’ can drive a woman crazy. Every twinge, cramp, and sensation leads her down a road of wondering if this is it! And then she hits early labor, contractions are regular, life freezes as it revolves around a 6-10 minute cycle. Then things get serious. Moms find themselves in labor world. Breathing, visualizing, and taking it one contraction at a time. The rest of the world fades out and the image of their baby is what carries them through. And then the urge to push hits and she takes an active role in the process. After feeling like days have passed (sometimes literally), one more push and in a blink of an eye, she has birthed life into this world. It is a journey that is hard to describe until personally going through it. As a doula, it is an honor to be invited into this process. I have been part of 7 births, one being my own. And every birth experience has been totally different and yet all beautiful. I had just assisted a couple at a birth of their daughter when I switched gears to walk through labor with my twin sister, Lauren and her husband, Evan. At 37 weeks and 6 days (May 14th), Lauren had contractions off and on all day. We officially entered into “is this it?” mode. During the final weeks and days, a doula is there to keep the mom (and partner) sane. It is so easy to question everything. I responded to texts and phone calls and helped ease the concerns and questions. I am learning how to wait with the mom as well. Because during these days my life feels like it is on hold, too. But I am getting better at continuing my life while still being on the ready. On May 16th, Lauren recognized that she was focusing too much on the sensations and so she released the day and painted, something that she hasn’t had the energy to do in a long time. May 17th came and luckily she had a wedding to distract her. It was Sunday night, May 18th that things really became consistent. And as Lauren defines it, labor really began. So many times woman ask, "How will I know I am in labor?" and the best answer I can give is, "You will know." Of course, that is not helpful at all for first time moms. But surely enough, they will know when things feel different than the practice contractions and Braxton Hicks they've been having before. That's part of my job, to help moms know what they are feeling. Contractions started coming every 5-7 minutes and lasting 1 minute that evening. We went for a walk and then tried to get some rest. Thankfully, I live across the street so I can go home to rest and feed my baby. Nighttime brought a fizzle in contractions but they were still occurring every 10 minutes keeping Lauren from a goodnights rest. May 19th, Lauren and Evan woke up and went for a walk. She tried using the breast pump to stimulate contractions as well. By 9 am contractions were 6-7 minutes apart and lasting 1.5 minutes long. She was exhausted. So we tried the tub knowing it would give her some reprieve. It actually stopped contractions for 20 minutes giving her a good nap. A walk, a nap, rebozo, back rubs, pelvic rocks, birthing ball, card games, a walk, food… it was a day of alternating between rest and activity, stopping every 6 minutes to help Lauren through a contraction. It was such a mind game dealing with consistent contractions that would start picking up and get really intense, and then fizzle out in strength. By 8 pm everyone went ‘to bed’. May 20th came with hope in the air. Contractions were steady all night but Lauren needed a change of scenery and Evan needed a good nap after being up the last 2 nights with Lauren. So Lauren came to my house and my mom and I massaged Lauren and walked her through contractions while Evan slept for 3 hours. Things were picking up once again and we left at 12:30 pm for Lauren’s scheduled midwife appointment. The news was not the most encouraging, baby was station -3, cervix was very posterior and only 25% effaced and 1 cm dilated. They were having a long, prodromal labor. Lauren and Evan took the news like champs and decided to go to get milkshakes and walk in the park. I went home and had a major breakdown. As a doula, it is very important to process your own birth experience thoroughly before helping another mom. I thought I had adequately dealt with everything that happened in my labor but after walking Lauren through 3 days of early labor (identical to mine) and then hearing that she really hadn’t progressed much (also similar to mine), it truly brought me back to the deep, hopeless feelings I experienced in my own birth. It was very painful. I held it together until I ran to the car and bawled my eyes out. I was so exhausted from 3 days of being with Lauren, I couldn’t even imagine how she felt. And then to find out that she was really still near the starting point just overwhelmed me more than I could handle. After talking to my mom, my husband, and my childbirth educator (and doula ‘consultant’), I realized that there was still trauma from my birth that was surfacing by watching my twin sister go through it. 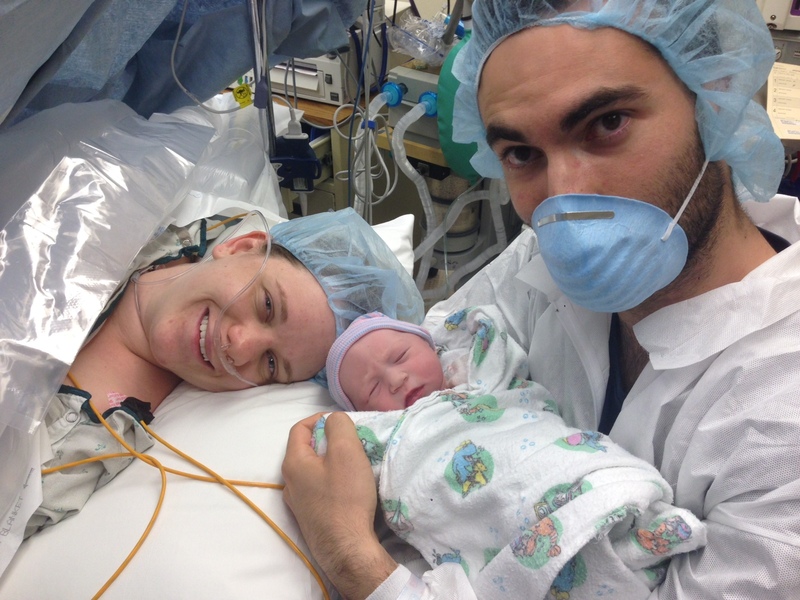 I was triggered by some post-traumatic stress that I experienced during my long labor. My mom graciously walked me through those emotions and helped me work through them. I took a break from seeing Lauren and Evan knowing that it could still be days before anything happened. So I napped. I checked back in with them around 7 pm and contractions were still 5-7 minutes apart and Lauren had just showered. She said it was during the shower that she felt like she let go of all expectations and told her baby and her body that they were free to do what they needed to do. It was her ‘moment of truth’. Moms face this moment in early labor. It is the point that most people who aren’t planning a natural birth get an epidural. The next 3 hours they ate food, played Monopoly Deal, and hung out with Evan’s brother. I came back over at 10:30 pm when she got in the bath to see if her contractions would ease off at all so they could rest. They didn’t. Lauren got out and looked me in the eye and said, “It’s time to go to the hospital, NOW.” I never question a mom when she says this. They know. Her contractions were coming now at 2-3 minutes apart. So we raced to the hospital. I knew something was strange because her contractions were so strong and close together and yet Lauren was still very alert and aware of her surroundings. So I really didn't know what to expect when we got to the hospital. Unfortunately, it was after hours so we had to enter in the Emergency Room. That was awful. But 20 minutes later we made our way to triage. At 11:30 pm, Lauren’s midwife checked her progress. Baby was station -1 and the cervix was 90% effaced and 3 cm dilated. Progress! I knew that with contractions this strong it wouldn’t be long before she would be admitted. But I could tell that the midwife had some concern on her face. She said that she felt something soft, it didn’t feel like the baby’s head so she called for an ultrasound. Five minutes, two midwives, and two doctors later, they confirmed that baby Nora was breech. All their plans for a natural, vaginal birth changed in a second. It was crushing. They hadn’t planned for a C-section at all. They had spent months preparing for a natural birth. In minutes, people came flooding into the tiny triage room to prep Lauren for surgery. Thankfully, we were able to ask a lot of questions and it was very important to me that Evan and Lauren knew what to expect. The staff were very kind and delicate knowing that this was so far from what Lauren wanted. The anesthesiologist went through the whole procedure with Lauren to make sure she understood what was about to happen. I just rubbed Evan’s back, hugged him, and kept him calm because I know he was very disappointed in the change of plans. Lauren was incredible. Of course this was not what she wanted. But she also knew that it was time to meet her baby. She had that sense at home knowing it was time to go to the hospital. She was so brave as she continued to work through painful contractions knowing that it would all be over soon. I just held her hand and told her that she was going to meet her baby in 30 minutes! They took Lauren back at 1 am to get prepped. The nurse came back with the protective clothing for both me and Evan. Vanderbilt has a policy that only one person can be in the operating room at a time but they were so kind to let me switch places with Evan once the baby was born and taken to the nursery. I called our families and they rushed over. I then walked Evan through what he should expect and helped him understand what would happen once the baby was born. They then took Evan back to the OR and I showed our families where to wait. Nora Marjorie was born on Wednesday, May 21st at 1:37 am. Lauren’s midwife came out to get me and I JUST missed Evan walking out with Nora. But I knew it was ok, because I really wanted to see Nora for the first time with my sister. I was so nervous walking into the OR because I was not sure what it would be like to see Lauren cut open like that. I walked in and went straight to Lauren’s face. I sat down next to her, stroked her hair, and held her shaking hands. Over and over again I kept telling her how proud of her I was and that she is now a mommy! I was so touched by how Lauren was acting. She was so excited and happy. She kept saying, “Merrill, Nora is so beautiful, I love her so much! I can’t wait to see her again. I can’t believe she is mine. I love her so much!” I am so grateful for her midwife for staying in the OR with her and allowing them to have a minute of skin-to-skin right after delivery and giving Lauren and Evan a chance to bond with Nora before whisking her off. The doctor came to Lauren’s side and said they did an incision on her that will set her up for a VBAC during her next pregnancy (Vaginal birth after a cesarean). I sat with Lauren for 40 minutes as they sutured her back up. We were in so much awe that she just birthed a baby. Her daughter is here. It is a moment I will remember forever. Seriously, she was so strong and brave. I have so much admiration for her! Once they were done, we both went to the recovery room with a quick stop in the hallway to see the parents. And then the moment came where Evan came in with Nora. Goodness, it was so precious. We got the baby skin-to-skin with Lauren and Nora immediately went to breastfeeding. I stepped out of the room for 15 minutes and the three of them spent their first moments together as a new family. Parents and siblings said a quick hello and goodbye. We then got Evan and Lauren comfortable in their postpartum room by 4:00 am and I finally left at 5:00 am. This birth taught me so much. It is so important to be informed and educated on the type of birth you want, but ultimately you have to work with the situations you find yourself in. C-sections are rarely someone’s first option for birth, but in the case where it needs to be done, it is important to still empower the mother in the experience. It was very important to me that Lauren knew that there was nothing she did or could have done differently. That she did nothing wrong. It is also essential that the mom knows that she DID birth a baby. After 3 days of consistent contractions, she did go through so much labor and she did birth Nora. She worked hard! But when births don't go according to plan, moms need to be given the room to process their disappointment. Most people say, “Well at least mom and baby are healthy”, which is absolutely true! But we must also recognize that moms can still feel a loss when their birth was different than expected. This doesn't only apply to c-sections. It can happen to moms who, on paper, had the ideal birth experience. Child birth is a powerful experience and every woman responds differently. As a doula, I must be available to process those emotions. I feel so much more equipped to walk a mom and her partner through this process if in the event that a c-section becomes necessary, they still have an intimate, empowered birth. I also learned how important it is to process my own birth. Thankfully, this all surfaced with my sister as my client. I am grateful that I was triggered so that I could work through some parts of my birth that still needed healing. Don’t get me wrong. I had a beautiful birth and the natural, home birth I had wanted. But my labor uncovered childhood trauma, it lasted 4 long days, and it had extreme lows when I thought I was almost about to meet Genevieve and I was only in early labor. It was the hardest event of my life and it came with trauma on my body. But Lauren’s birth was so beautiful for unintentionally bringing healing to me. As a doula I had to see that it's not about my strength for the mother that will get them through, it's up to them. It wasn’t my birth and it wasn’t my mountain to climb. It is their inner strength that will carry them through. I am just their to walk alongside them. Lauren climbed her own mountain that she had to overcome and she did it with so much courage! Having this experience reiterated that birth is magical and birth is beautiful. Bringing life into this world is a big deal and walking alongside a mother in labor is a privilege. Welcome to the world, Nora Marjorie. We sure love you. Hi, we have never met, but a friend of mine posted your blog on Facebook a few months ago and I started reading it. It was really cool to follow since I was pregnant, due in February, and you were a few months ahead of me. Anyways all that to say I appreciate this post because I was really hoping for a drug free natural birth and ended up having a c-section. Afterwards it was really hard for me to accept what happend and I felt sorrow for not having the opportunity to "birth" my son. It was hard for me because my baby was healthy and safe so I felt guilty for grieving over what happened. Your post helped me realize that it is okay to feel that way, thanks for letting me know I am not the only one! Melissa, thank you for sharing a piece of your story. You are not alone! 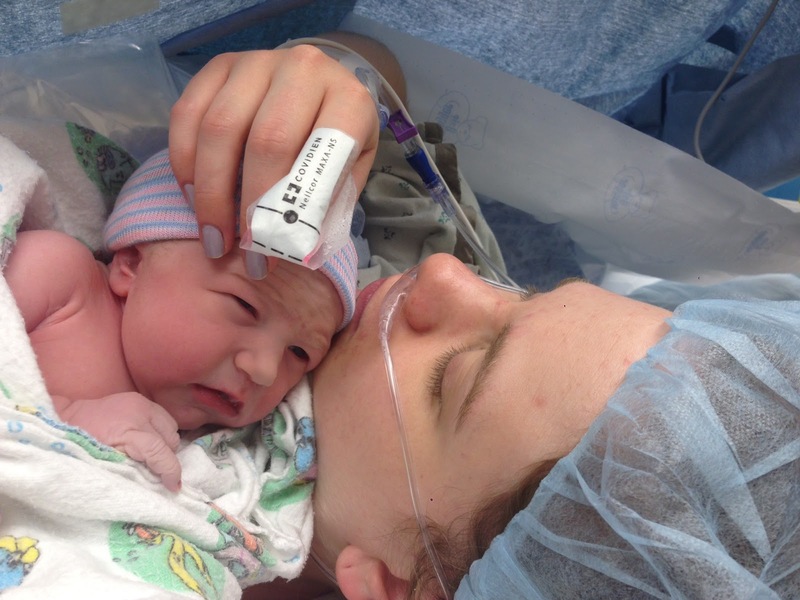 Birth is hard and such an impacting experience on a woman. You definitely birthed your son! But it's also ok to grieve the experience. Especially when you spent months imagining it a different way. That's part of my role as a doula - helping moms process the birth. I hope you have beautiful, successful VBACs in the future, and in the meantime, you find healing as you snuggle your little boy. Many blessings to you!